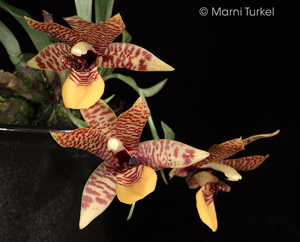 Promenaea guttata outcross #2550 ('Ben' x 'Leon') (approximately 25 seedlings per flask). 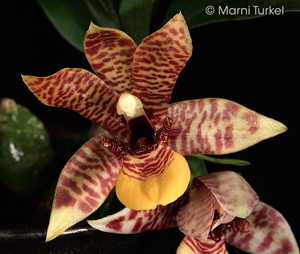 The Species: Promenaea guttata is a member of the Zygopetalum alliance from Brazil. It usually has two flowers per inflorescence in the Spring and Summer. The foliage is a soft grey-green color. It is a compact plant, with upright to arching spikes. Culture: Promenaeas can be easy to grow in cool-intermediate to cool conditions. Moderate light levels and regular dilute fertilizer. I have grown it in fine bark mix, light terrestrial mix as well as mounted. I water year-round and water as it before it approachs dryness. One of the secrets of growing promenaeas is do NOT repot/remount when a new growth is coming. Wait until the growth has matured. If you repot at the wrong time, the plant can sit for years before it begins to grow again.